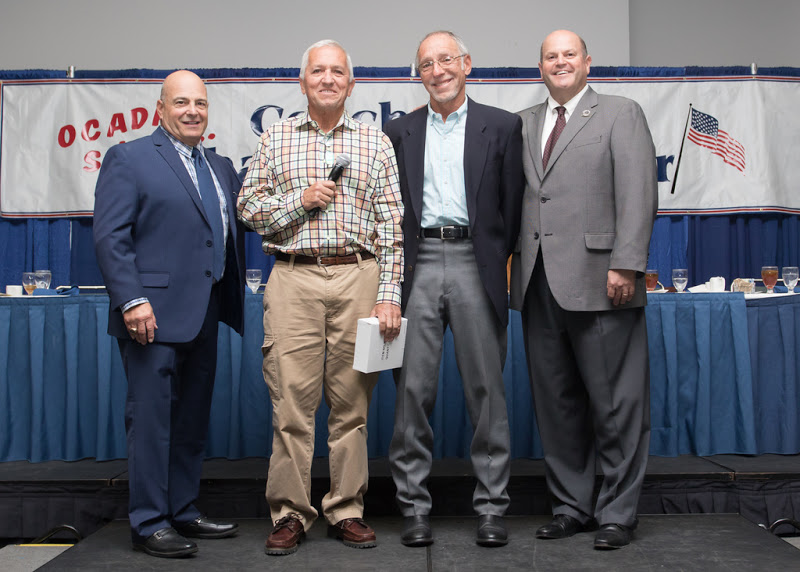 Congratulations to Coach Mike Gerakos for being named an Orange County Athletic Directors Association “Coach of Character”. Coach Gerakos was recognized at an awards ceremony on Monday night. Coach Gerakos is our Activities Director, PE Teacher, Baseball Coach, and Best Buddies Coordinator here on campus. Thanks for everything you do here at UNI and for being a true Coach Of Character! Below is a picture of Coach Gerakos receiving his award. 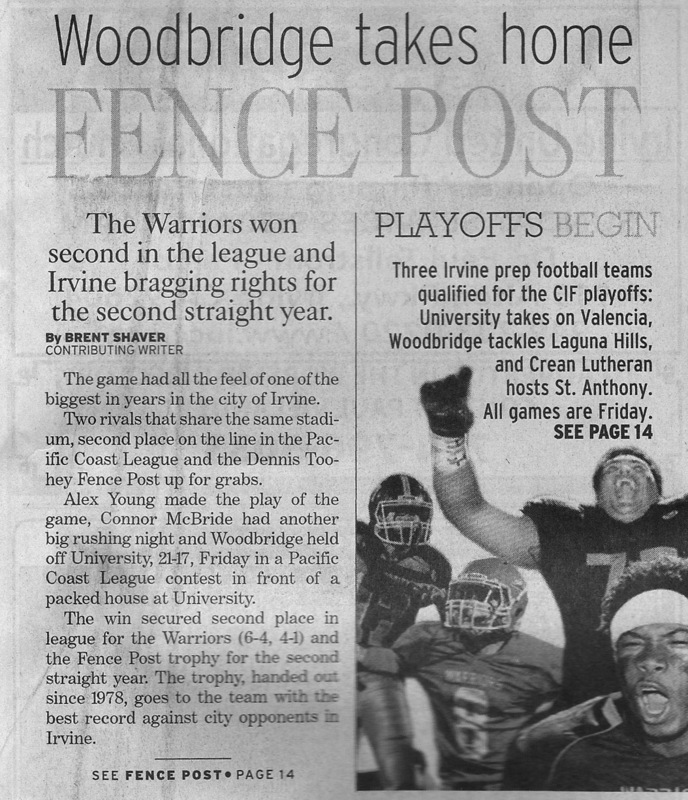 Football – Our football season came to an end last Friday night in the first round of the CIF playoffs. Our boys fell to the #4 seeded Valencia Tigers by a final of 37-14. The final score did not indicate how close this game was. Our defense shut down the high power offense for most of the first half. A blocked punt led to a Valencia score and two long passes on third and longs let to two late touchdowns in the first half. Our boys came out and drove the ball down the field to open the second half to cut the score to 17-7. Valencia and UNI then traded touchdowns to make the score 24-14. Two late scores by Valencia led to a final of 37-14. We want to thank our players for such an amazing season. The energy these boys brought was contagious. Girls Golf – What a week for Ellen Takada. 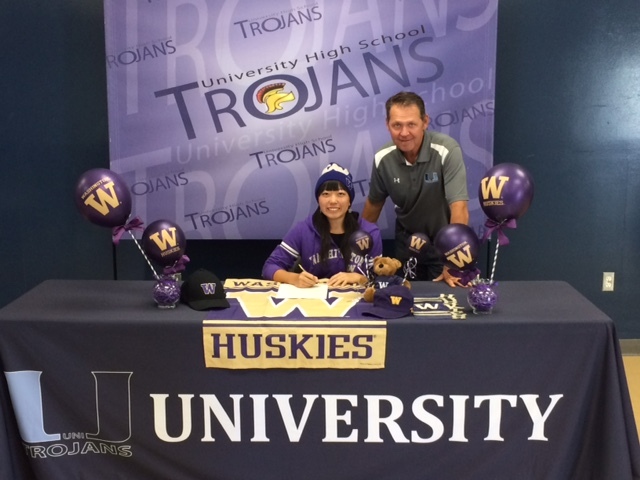 Last Friday she signed her national letter of intent to attend the University of Washington on a golf scholarship. On Tuesday she placed 8th in the entire state at the CIF state golf finals. Congratulations to Ellen on a fabulous season. Below is a picture of Ellen signing her letter of intent. Girls Tennis – Congratulations to Senior Michelle Maddox and Junior Ashlyn Wang for making it to the CIF individual tournament. Our girls will be competing next week. Good Luck girls. 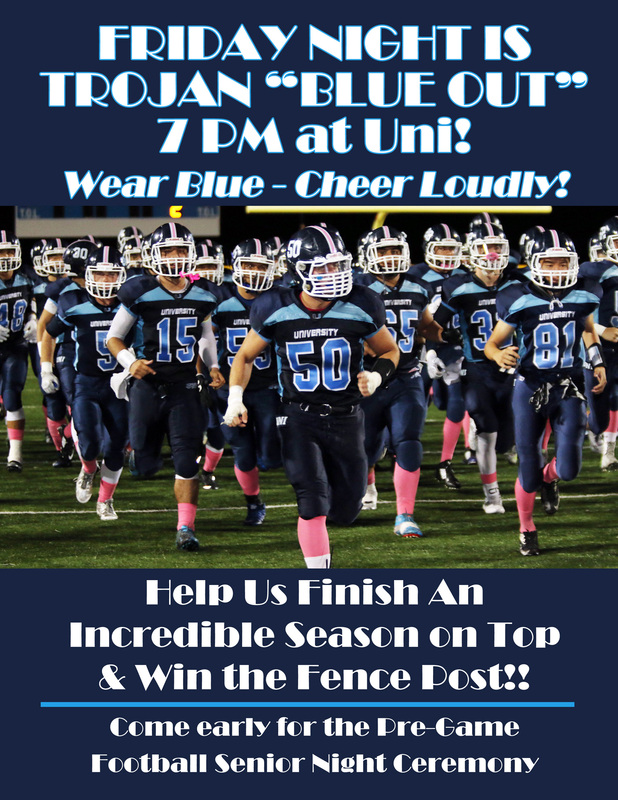 Trojan Thursday will take a two week break as we are in transition from Fall to Winter Sports. Make sure you head out and support our UNI Winter athletic teams. Boys and Girls Cross Country– Cross Country finished up their season with league finals at Irvine Park last Friday. More than 95% of the team finished up with their season best times at this meet. On the Girls side, our top ten finishers included Junior Janine Bryant followed by Freshman Sara Sussman, Freshman Abby Sanders, Senior Stacey Yu, Junior Anna Pan, Senior Andrea White, Senior Bessie Liu, Junior Gentil Nguyen, Sophomore Setareh Emadi and Freshman Kamellia Parsa. Our top ten finishers for the Boys included Senior Eli Tita followed by Senior Mackhai Nguyen, Senior Eric Kawana, Junior Luke Ruan, Freshman Ahbi Nisha Anish, Sophomore Christian Go, Freshman Cyrus Bower, Senior Carlos Roman, Junior Hyato Kato and Freshman Elias Cannesson. With all of the young talent we look forward to next year and more success. Go Trojan Running! 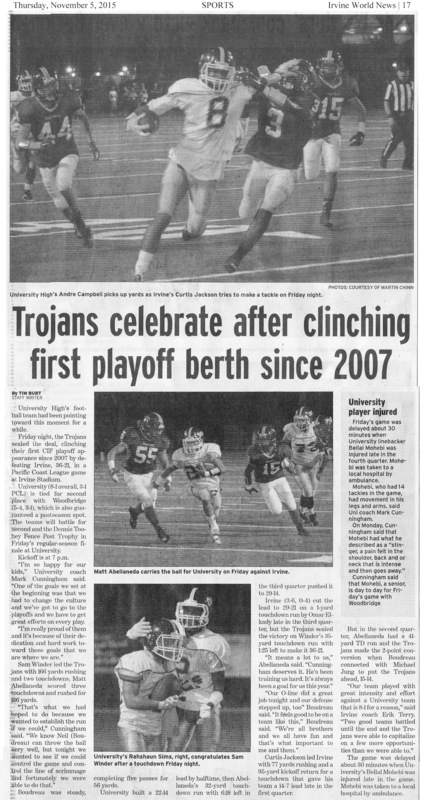 Football – What an exciting atmosphere last Friday night. The stadium was completely sold out and there was standing room only. Our boys ended up dropping this exciting game by a final of 21-17. The game went back and forth all night. Andre Campbell tied the score at 7 with his 6 yard Touchdown run in the first quarter. Woodbridge answered with their own Touchdown to take a 14-7 lead after one quarter. Sam Winder raced in for a 5 yard scoring run to once again tie the score. 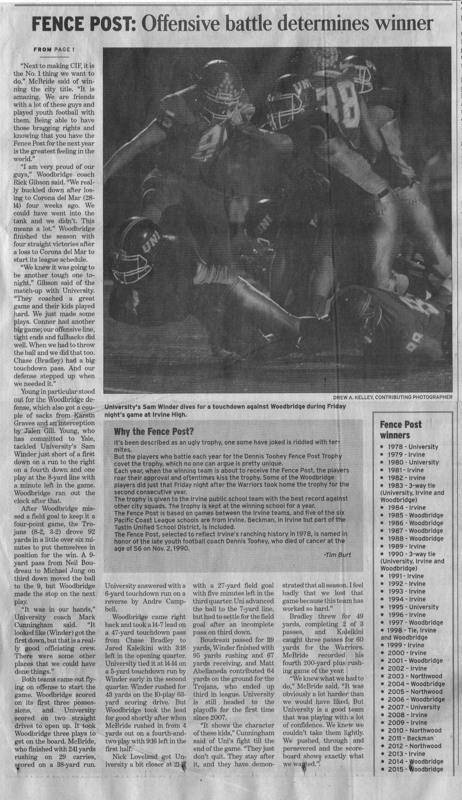 Woodbridge took a 21-14 lead in the third quarter and our boys answered with a nick Loveland field goal late in the 3rd quarter to move the score to 21-17. A missed field goal by Woodbridge in the 4th gave our boys the ball and a chance to win. We moved the ball down the field but were denied on a 4th and 1 from the 9 yard line with 50 seconds left in the game. We want to thank everyone for coming out to this game. Coach Cunningham commented that this was the best atmosphere of any game he has coached while at UNI. Our boys will open up CIF play tomorrow night as we travel to Valencia for a 7:00 game. If you want to purchase pre-sale tickets they are available in the athletic office. Adults are $10 and students are $5. 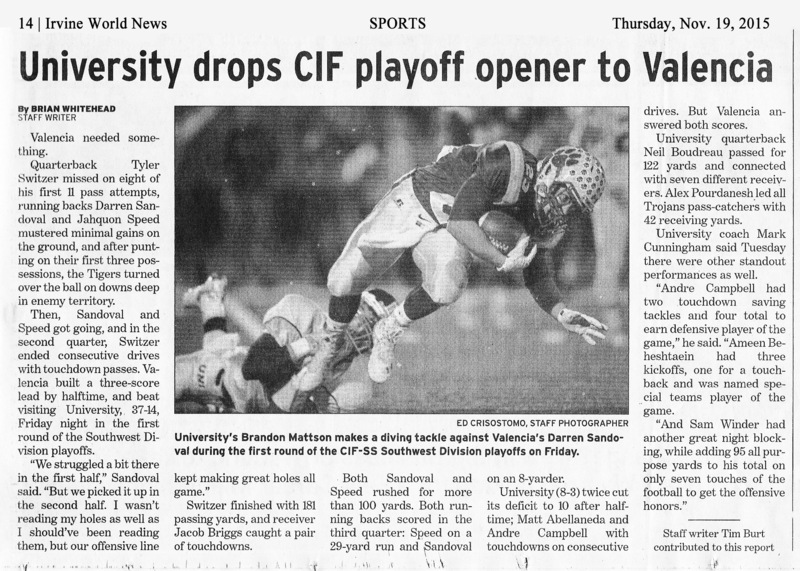 We hope everyone will come out and support our team in the CIF playoffs. Girls Golf – Last Thursday the girl’s golf season as a team came to an end. We finished in 5th place at CIF Southern Section finals. What an amazing season for our girls. Posting new school records for team low rounds and finishing the season as the #2 ranked team in Orange County and finishing up 5th overall in all of Southern California. Congrats Girls Golf on such an amazing season! Due to her great play at the CIF individual tournament last week, Senior Ellen Takada advanced to the state qualifying tournament to be played this afternoon. Good Luck Ellen! Girls Tennis – The girls tennis team concluded a very successful season going 15 and 6 overall and 7 and 3 in the Pacific Coast League. The girls defeated a tough Palm Desert team in the first round of the CIF playoffs. In the 2nd round the girls upset Campbell Hall, the 4th seeded team, 11 to 7. Judy Kam won two sets, Michelle Maddox and Ashlyn Wang swept their three sets at first doubles and Tiffany Markus and Sasha Iraniha won all three sets playing 3rd doubles. Unfortunately the girls lost to Dana Hills in the quarter-final round on Monday. Michelle Maddox and Ashlyn Wang once again won all three of their sets at first doubles. Congratulations to all of those girls who worked hard and gave so much time and effort to this program since the middle of August. Great season girls! JV Tennis wins League – Congrats to the Junior Varsity team who finished the season undefeated in both league and overall play. UNI also dominated the JV individual tournament. In singles, freshmen Cheyenne Crawley defeated fellow Trojan Ashi Parashar to win the singles championship. In doubles, Noelle Lee and Snigdha Vayalapadu defeated fellow Trojans Yuchen Fan and Elyana Lee to win the doubles title. Congrats on winning league and having such an outstanding season girls. Canned Food Drive – We have our Families Forward canned food drive going on the rest of the month. We are encouraging each student to bring 2 cans into school to help support those who are less fortunate. Today at lunch there will be a class competition to see who can build the best structure out of cans that have been brought in so far. The teachers will also have a team in this event. Get involved and send your student to school with a few cans tomorrow. THANK YOU – We have received tons of feedback about how special our student section was last Friday. 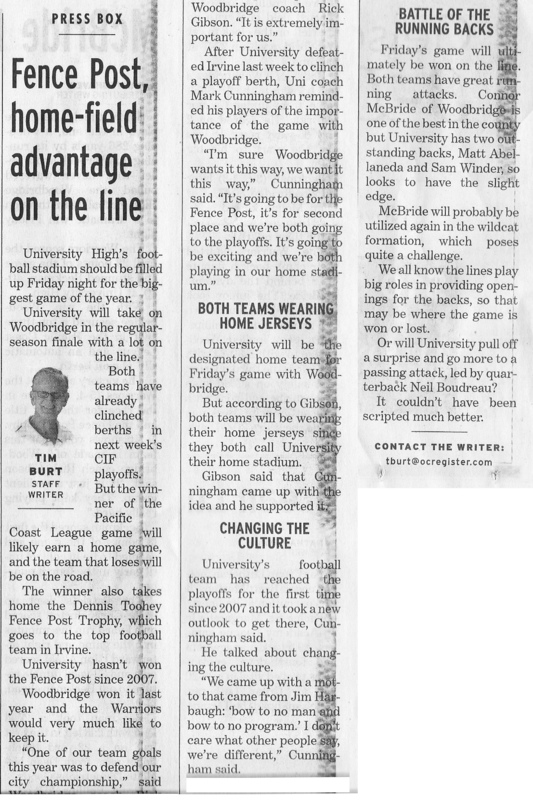 We have even received word from Woodbridge supporters commenting on how great our pre game events were and how spirited the Trojan Army was. We would once again like to thank the Clothier, Keeling Family, Dolan Family, and the Lutito Family for their donations to help make last Friday so special. We would also like to thank Michael O’Loughlin who was the starting QB on the class of 1974 team for making an extremely generous donation. With these donations and the donation from Daily Grill we will be able to give our Trojan Army free spirit towels, megaphones, and face paint. We also were able to purchase a second 20×30 foot banner that the students hold over their heads at the game. The school down the street from us copied our lead and purchased one of their own so we went out and bought another one. 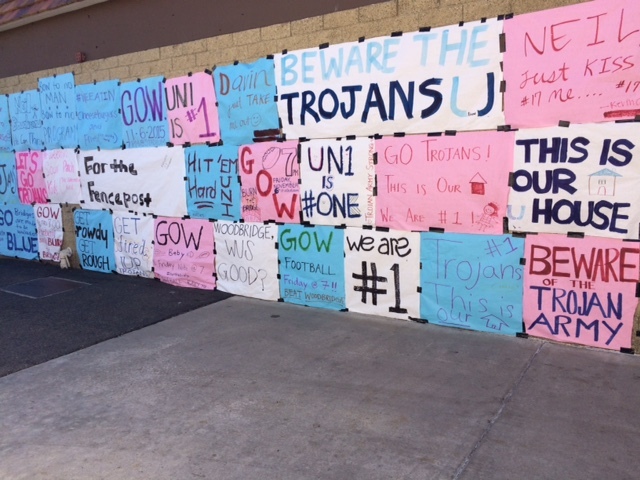 When they held up their banner our Trojan Army unveiled two of these huge banners with a chant of “Ours our Better” to once again show you can copy us but no school will ever have as much spirit as us.